Easy, Chocolaty & Guilt Free (Also Cute)! I first tasted black bean brownies at a party after an Aikido seminar in Boston. I thought they were fantastic; fudgy dense and chocolaty. These will definitely appeal to kids and are easy to make with a little adult help with the food processor. These brownies couldn’t be simpler to make. 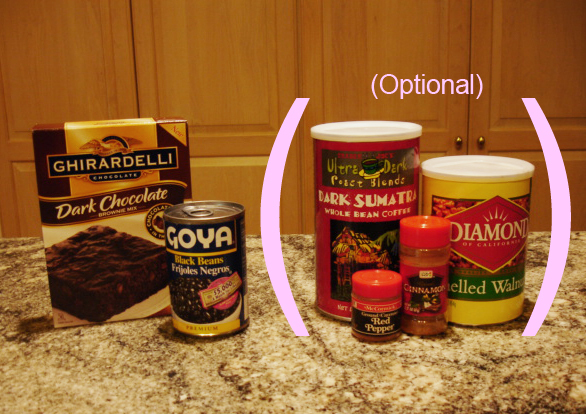 All you actually need is a box of brownie mix and a can of black beans. That’s it. I added some optional ingredients in the big silly pink parenthesis. I used a little strong, black coffee and a dash of cinnamon to give it a little more complexity – but I forgot to add a touch of vanilla to add a mellow note. I also added a couple of teaspoons of cocoa powder to make it even more chocolaty. For the truly adventurous, a dash of cayenne (I wasn’t that adventurous this time 🙂 ) And brownies aren’t brownies to me without walnuts. 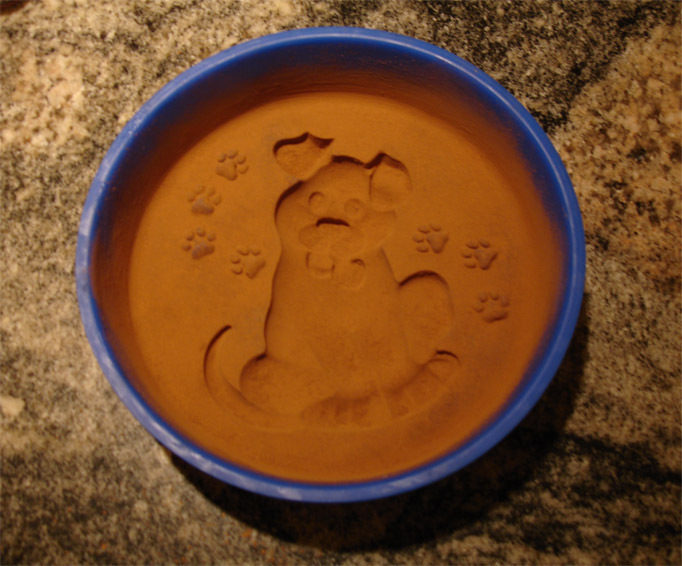 ZANDA PANDA Puppy Mold, which was prepared by brushing in melted vegetable shortening and lightly dusting with cocoa powder. Ready for the low fat brownie batter! Basic directions: I prepared the Puppy mold by lightly brushing the interior with melted vegetable shortening (Crisco), then dusting with cocoa powder. This helps to release baked goods and also gives their surface a smoother finish. 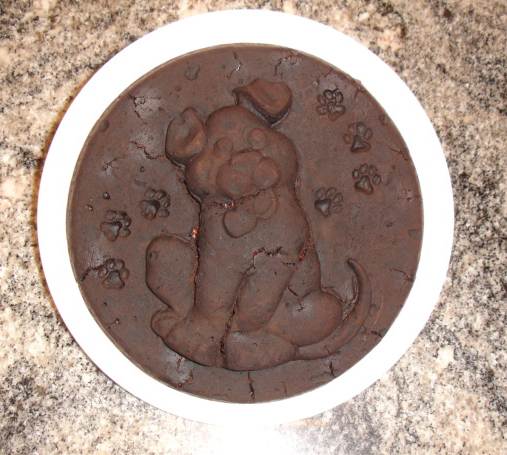 Puppy mold filled with brownie batter. 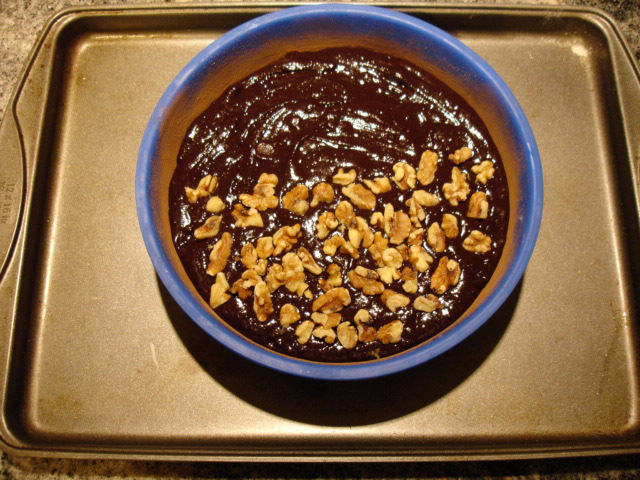 I studded half with walnuts, pressing them in slightly, but not enough to show on the decorative surface of the brownies. I like my brownies on the fudgy side. These came out a little more cake-y than I like them, because I overbaked them slightly. I thought that the middle was unbaked when checking wih a toothpick. I actually was hitting the melted chocolate chips. Duh. I don’t think the brownie would have cracked if I hadn’t overbaked it a little. Also the walnuts made the surface flex because they weren’t completey ’embedded’ in the back of the brownie. But it still tasted fantastic. The best part is that it’s not only super simple to make, it’s also low fat, high fiber, guilt free and chocolaty! And kids will actually like it! All in all, very cute and VERY tasty!!! We’re now taking reservations for Puppy Molds! There is no obligation when you reserve. We’ll notify you when they’re ready to ship and will hold your reservation for two weeks. To reserve, just e-mail us at: info@zandapanda.com and mention the Puppy Mold in the subject line. 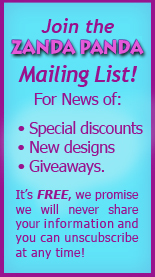 Join the Zanda Panda Mailing List for special offers, contests and coupons! It’s free, we will never share your information and you can unsubscribe at any time. Although we’d love to hear all about you, all we really need is your name and an e-mail address. 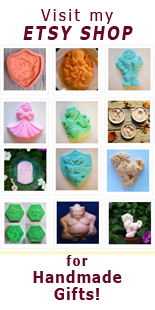 If you’re already subscribed, watch for a special offer on the Puppy Mold coming soon! This recipe is from Cooks.com. The only change I made was adding a handful of walnuts (although I think I might also add extra sunflower seeds in the next batch). I was looking for a recipe for “Kilkenny Bread”, it was a wonderfully delicious bread that my mom used to buy at the Farmer’s Market in Syracuse, NY. If anyone has a recipe PLEASE send it. I think if this bread was a little sweeter and had a little cinnamon added it might be a close approximation. Combine water, oil, honey. Stir in yeast and let rise to surface. Add 3 1/4 cups flour; let rest 20 minutes. Stir in salt, oats, millet and seeds. Add remaining flour. Knead 10 minutes. Return to bowl, oil crust. Cover and let rise until double. Knead 5 minutes. Shape into 2 loaves. Place in greased pans. Let rise until double. Bake at 350 degrees for 40 minutes. Amount 2 loaves. Butterflies in your Stomach…The Yummy Kind! It’s spring, and one of the ways I’ve been celebrating it is by making delicious tidbits with the Kaleidoscope Butterfly mold. The Butterfly Brunch page shows how to make butterfly appetizers with port wine cheese spread and crackers. 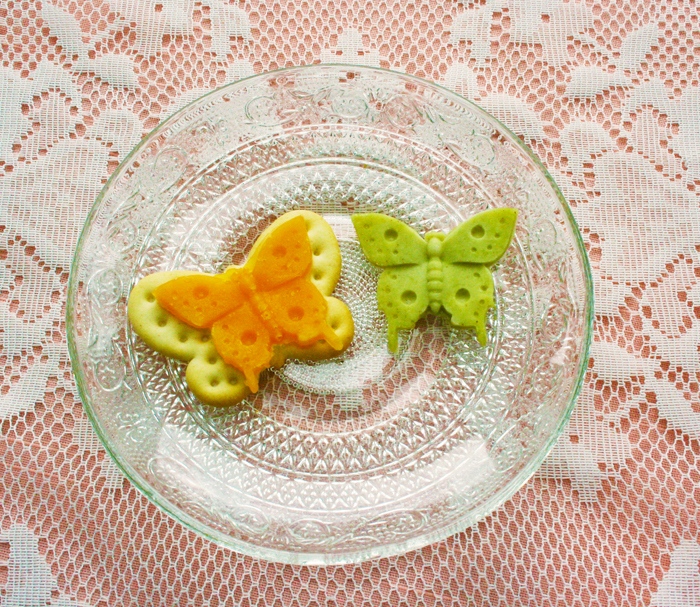 Today I made cheddar cheese butterflies on butterfly-shaped crackers and made sweet bean paste butterflies with lima beans! 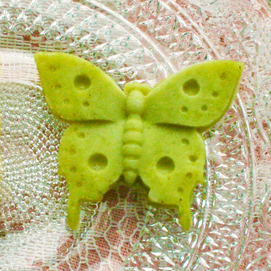 The bean paste really tasted great and the butterflies were a pretty, soft spring green. Making the cheddar butterflies is really simple. 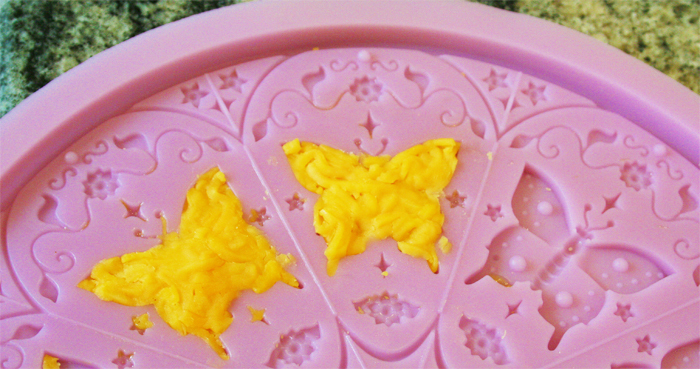 First, press shredded cheddar cheese into the butterfly shapes of the Kaleidoscope Butterfly mold. This part is great for kids to do because they get to squish it in. Microwave for three to five seconds on half power. Adult supervision with hot cheese, please! Dab them with a paper towel to absorb the excess oil that will rise to the top. When the cheese has cooled, flex the mold away from the butterflies and gently peel them off. 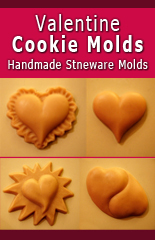 If you’re in a hurry, pop them into the freezer for a few minutes to cool them before removing from the mold. Flex mold away from butterfly to pop one side out, then gently remove from mold. 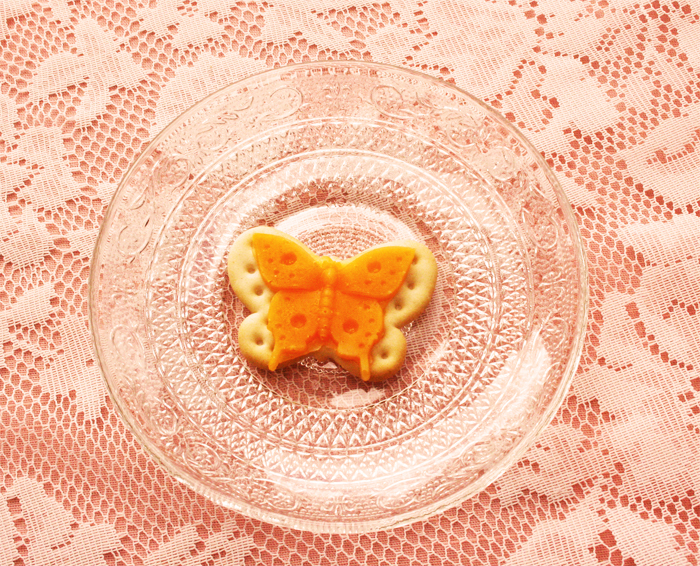 They look especially cute on Pepperidge Farm’s Butterfly shaped crackers. If you’re really feeling creative, you could make a flower from roasted red peppers for the butterfly to rest on. This is a very cute and easy appetizer for spring and summer get-togethers. It’s also fun to make with kids (just be sure to help them with the microwaving). I really like sweet red (adzuki) bean paste. I didn’t have any on hand and I wanted to see if it would work in the Kaleidoscope Butterfly mold. I did have lima beans, so I cooked about a cup of them until soft, drained them and added a little less than a cup of sugar and a dash of cinnamon. You are supposed to remove the skins, but I just put everything in a food processor. I tried it in the mold a bit chunky and then some that had been pressed through a sieve. I froze them for a few minutes before removing from the mold, as the paste is very soft. You wouldn’t want to handle them after they defrosted (put it on a cookie, custard tart or ice cream while still frozen). I think both the chunky and smooth version came out great. 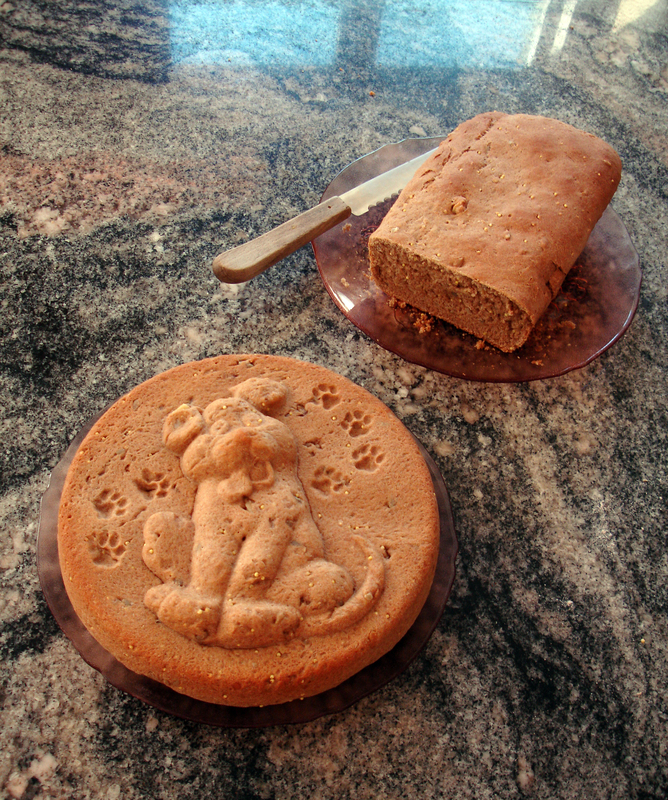 It tasted wonderful, took the details from the mold very well and the color was very pretty. I’m surprised that I’ve never seen lima beans made this way before! I also experimented with guava paste, but it remained gooey even after freezing. I added confectioner’s sugar to some to see if it would stiffen up, but it changed the lovely flavor too much. If you have an idea for guava or tamarind flavored jelly or paste that would be moldable, please let me know! Yes, I had to wait patiently for the apple tree to bloom for this shot – and for a sunny day! Jump over to the Zanda Panda website to see how to make all the goodies pictured above, such as butterfly cake and cupcake toppers, embossed tea sandwiches, Kaleidoscope Heart and Butterfly mini sandwich cookies and port wine cheese butterflies on crackers! I didn’t have room to show the iced tea with little butterfly ice cubes (just freeze colorful fruit juices in the Butterfly mold, then add to iced tea). Beautiful stoneware pottery courtesy of the very talented Ria Lira Levine. Easy, fun ideas for spring or summer entertaining – and a really tasteful way to tell Mom how much you love her this Mother’s Day! Join the Zanda Panda Mailing List for new product news and special offers only for list members (It’s free, we promise NEVER to share your information and you can unsubscribe at any time). This cake is very easy to make, even for kid chefs and novice bakers. The recipe has lots of room for experimentation to give it your own special twist. It also uses the tub from the cream cheese to measure the other ingredients, so clean-up is very easy. The recipe is an adaptation of a heart-healthy cake recipe by Paula76 in reply to a Chowound post on heart-healthy cake recipes (http://chowhound.chow.com/topics/574561), for use with the Zanda Panda Kaleidoscope Heart Mold.